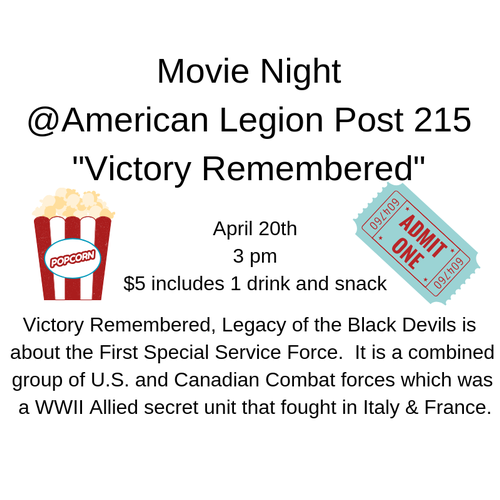 American Legion Post 215 is hosting their very first Movie Night! For just $5 you can enjoy an amazing movie, learn a little something about military history, enjoy a free drink and snack. Extra snacks and drinks will be available for purchase. On April 20th, the doors will open at 2:30 and the movie will begin at 3 pm. We will be featuring the movie Victory Remembered, Legacy of the Black Devils. The movie is produced by a fellow Goochlander, Les Owen who served in the US Army and is dedicated to ensuring the history of the Special Forces and other elite groups is remembered. "The worst is yet to come" (Das Dicke Ende Kommt Noch!) This message of warning was left behind enemy lines by the First Special Service Force (FSSF), one of the most highly trained, deadly and effective units of World War II. Their commitment to victory was unwavering, with a staggering 25:1 kill ratio, but a high price was paid with 137% casualties. The FSSF, dubbed "the Black Devils" by terrorized Germans, are considered the forefathers of Special Forces today. $5 for a movie, drink, and snack. You will be able to purchase additional drinks and snacks.